The New Zealand orchid flora has a distinctly Australian flavour in many instances, with some lovely differences. The Pterostylis greenhood orchids, for example, look at once familiar and different. Pterostylis banksii was one of my favourites: a giant flower surely getting close to our P. falcata, but with almost grotesque exaggeration in lateral sepal shape, or the 'breast' of the orchid. It really is quite an impressive flower to see. The long, red tips to the lateral sepals are swept back in a very elegant manner that varies slightly from flower to flower. Pterostylis banksii in its natural forest floor setting. Note the exceptionally long leaves! Interestingly, many of the NZ greenhoods (including P. banksii) have much longer, broader leaves than our Australian versions. I wonder why. I also saw a couple of other greenhoods I am not confident in labelling to a species. This one appears to be Caladenia minor or perhaps aff. minor because of the reddish black stem. Overall very similar to the Australian ones. I also came across some warty looking Gastrodia or potato orchids in the Catlins. I'm not entirely sure which one it is, but it looked magnificent in its own kind of ugly way. Just nearby I found two plants of the odd Aporostylis bifolia. Some kind of warty looking Gastrodia sp. 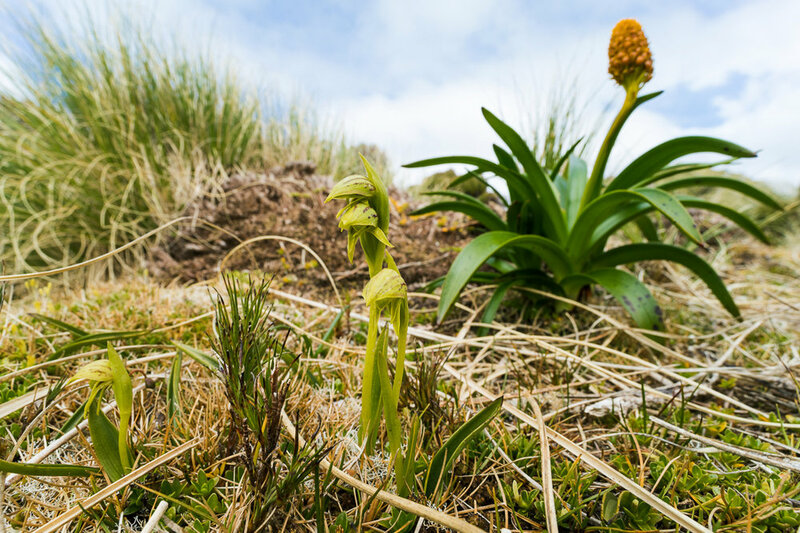 On Enderby, off Auckland Island, we came across one Prasophyllum colensoi growing out of an Astelia mound right next to native Enderby Island gentian. I love it when orchids are considerate of us photographers and arrange themselves into pleasing compositions! Prasophyllum colensoi, Gentian sp. and Astelia sp. On Auckland Island itself we had great views of both Corybas oblonga and Corybas triloba. We had the opportunity to land at Tagua Bay where there were ruins of old buildings used by coast watchers during WW2 and apparently a nice vantage point at the top of a small hill. Unfortunately I had my head in the leaf litter looking at the orchids and barely made it half way up the very small hill. And I was rushing! Orchid photography is a very slow business. Corybas oblonga. I think we were a bit late for the best flowering of this species. Corybas triloba. We only found a few flowers of this species and all were hard to get satisfactory photos of in the dense forest litter. On Campbell Island I got the opportunity to spend some time with the odd Waireia stenopetala. In many ways it looks like a greenhood; certainly it is green and hooded. But its not related to greenhoods as far as I know. Its the only species in its genus. Three plants of Waireia stenopetala, with Bulbine rossii in the background.